Washington Township, Gloucester County, NJ – Jay Kandle’s family has owed a local recreation and campground business for generations that relies on a large lake for boating and swimming. The dam controlling the lake was old and in need of replacement. CES reviewed Rowan University’s hydrologic and hydraulic studies. 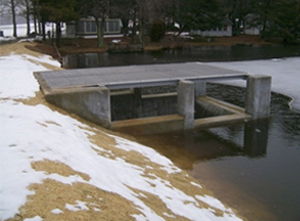 These studies revealed that the existing dam could not handle the design storm as required by the New Jersey Department of Environmental Protection (NJDEP) Dam Safety & Flood Control Section (DSFC). 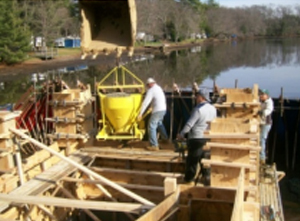 Mr. Kandle hired CES to provide dam safety inspection services, surveying, dam design, and permitting that included wetlands delineation, land use, dam safety, and soil erosion permit applications. CES also prepared an Emergency Action Plan and an Operation and Maintenance Plan for the dam. 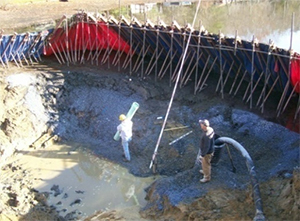 The replacement dam consists of a concrete spillway, concrete box pipe, and embankment and roadway improvements. The dam was substantially completed in January 2010. CES also provided construction management, inspection, and close-out services for the project.